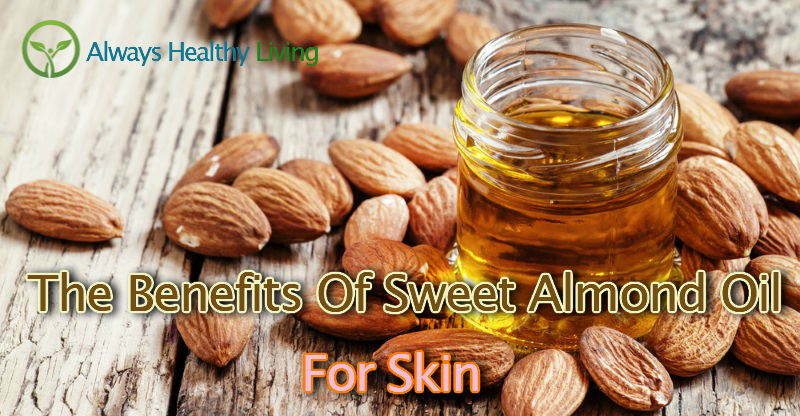 For thousands of years people have been using sweet almond oil for skin care and for a range of health problems. In the 1st century AD the Greek Dioscorides, the author of the famous medical text ‘De Materia Medica’, used sweet almond oil in ointments he applied to the skin of Roman soldiers to cure their ailments. And its use for treating skin conditions such as eczema and psoriasis has long been taught as a part of ancient Chinese, Greco-Persian, and Ayurvedic branches of medicine. In recent times, its ability to act as a natural moisturizer for the skin that improves the complexion and reduces the signs of aging has led to an increased popularity in its use in cosmetics and with natural beauty enthusiasts. 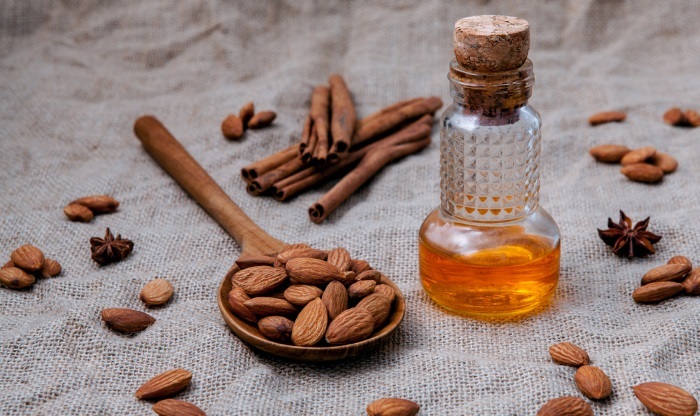 In this article I’ll show you the benefits of sweet almond oil for your skin, and how you can add it to your daily regime. 1 What Is Sweet Almond Oil? 1.4 Is Sweet Almond Oil Good For Skin? Almond oil is obtained by extraction from the edible seeds of the tree Prunus dulcis. We commonly know the seeds as almonds. The almond originated in the Mediterranean area of the Middle East and was dispersed by humans throughout the Mediterranean, parts of Northern Africa, and Southern Europe in ancient times. Its popularity has led to it being called ‘the king of nuts’ and it can now be found around the world in areas with a Mediterranean type climate, with warm and dry sumers and mild and wet winters. These days, the majority of the world’s almond supply is grown in California. The majority of almond trees produce sweet almonds, named after their sweet taste. However, some produce a different variation known as ‘bitter’ almonds . You can purchase sweet almond oil or bitter almond oil but there is a fundamental difference between the two that is important to understand. Sweet almond oil is a ‘fixed’ oil. Fixed oils are what you commonly think of when you think of an oil, and contain the fatty acids that are present in a plant. The oil that is advertised for sale as bitter almond oil is an essential oil that doesn’t contain the fatty acid component. During the processing of bitter almonds, a reaction between the enzyme emulsin and a soluble glucoside called amygdalin in the presence of water leads to the creation of hydrogen cyanide. Due to its lethality, this cyanide is removed to leave an essential oil that is almost pure benzaldehyde, the substance that provides its bitter flavor. Bitter almond essential oil is usually used for its almond scent, or in very small quantities for its flavor. The oil that is popular for skin care and culinary use is sweet almond oil. 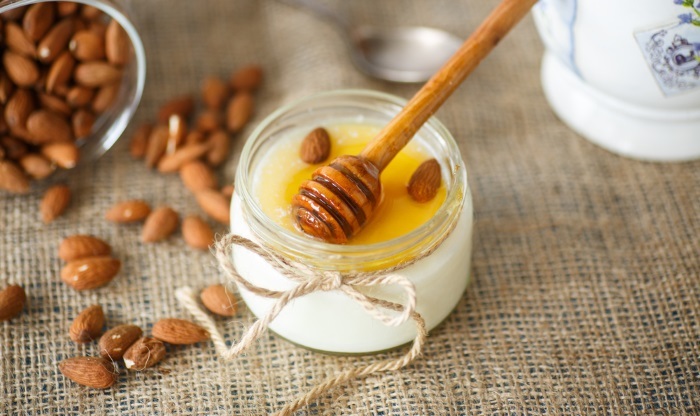 The majority of sweet almond oil is made up of fatty acids. The biggest constituent is the monosaturated fatty acid oleic acid, which accounts for approximately 62% of its make up. Linoleic acid, a polyunsaturated fatty acid, is also present in large quantity. It also contains plant phytosterols such as beta-sitosterol, campestanol, sitostanol, stigmasterol, and campesterol that are bioactive. It has high levels of vitamin E, the B vitamins niacin and riboflavin, and the minerals magnesium, calcium, manganese, zinc, and phosphorous, which are all eseential for good health. Almonds are highly regarded in some cultures, and sweet almond oil has been used as a part of traditional medicine for thousands of years. Is Sweet Almond Oil Good For Skin? Sweet almond oil is a popular choice for using on the skin. It’s light and easily absorbed and is commonly used as a massage oil due to its mild and pleasant propeties. It has a reputation for being a good moisturizer that’s safe for people with sensitive skin, and it keeps the skin looking soft, smooth, and more youthful. The best almond oil for skin care can be obtained in its 100% pure and organic form. It can slso be found in a wide range of cosmetic products, where it’s often used as a carrier oil. Let’s take a look at its benefits for skin more closely. One of the most popular benefits of almond oil is its ability to provide deep and long lasting moisturization of the skin. It’s absorbed easily at body temperature without leaving the skin feeling excessively greasy. With regular use your skin will feel soft, smooth, and supple. 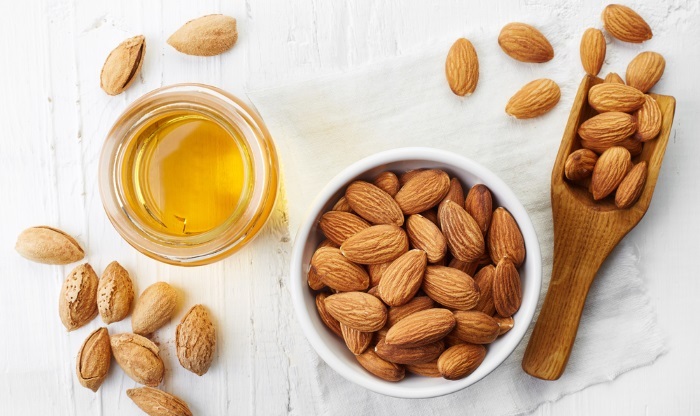 Sweet almond oil is rich in antioxidants that protect the skin, including vitamin E.
A 2007 study on mice demonstrated that when applied to the skin, almond oil can reduce damage after UV exposure (1). This also resulted in a reduction in photo-aging of the skin. Photo-aging is one of the main processes responsible for the formation of lines and wrinkles on your skin, so the regular application of almond oil has anti-aging benefits. However, its photoprotective effect is not strong enough to act as a sunscreen, so you should still be careful about prolonged sun exposure. If you’ve spent too long in the sun, then applying almond oil to your burnt skin will help to soothe the itchy and sore areas. Not only does it help the skin to stay hydrated, but it also contains vitamin E which helps to reduce the harmful effects of sun damage that continue to occur for hours after you come into the shade. The emolient and moisturizing properties of sweet almond oil also contribute towards its use as a natural treatment for skin conditions involving dry and flaky skin on the face and body. It’s a mild and hypoallergenic oil that has anti-inflammatory properties and can relieve itchiness. It’s been traditionally used in Ayurvedic and Chinese medicine for its ability to help with both eczema and psoriasis (2). Doctors often prescribe zinc based creams and ointments to treat rashes caused by the friction of skin against clothing or against other skin. The moisturizing properties as well as its high zinc content make sweet almond oil a good natural option to treat skin rashes and relieve the burning sensation and soreness. Both anecdotal reports and clinical observations have suggested that almond oil can reduce hypertrophic scarring when it’s applied post-operatively (2). It rejuvenates and smoothes the skin, improving its appearance. The moisturizing properties of sweet almond oil make it a great natural remedy for dry and chapped lips. Just a small amount will keep your lips well hydrated, smooth, and soft. And the nutrients it contains will help to repair the skin. Almond oil’s ability to easily penetrate the skin makes it a good oil cleanser that can help to soften and dislodge built up dirt, debris, and sebum in the skin’s pores and hair follicles. It also makes an effective makeup remover that’s gentle on sensitive areas of the skin, such as the under eye area, eyelids, and lips. It easily cleans up most makeup including waterproof eye mascara that can be difficult to remove. The anti-inflammatory and moisturizing properties of sweet almond oil make it good to apply to the skin after shaving to prevent and reduce razor burn. Almond oil can be used on its own as a moisturizer or in combination with other beneficial natural ingredients in face masks and scrubs. 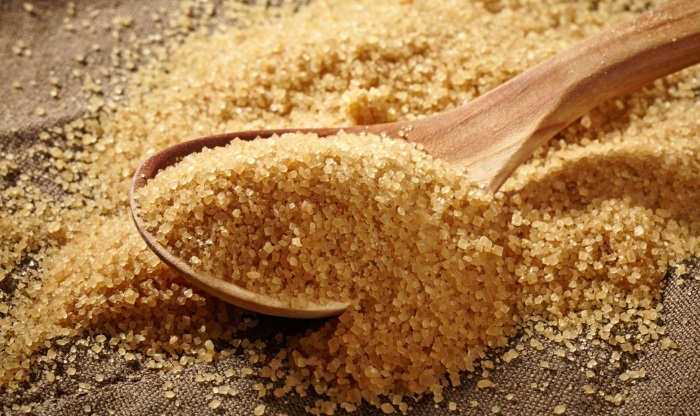 The addition of sugar makes a simple and easy to make face scrub for exfoliating dead skin. Honey contains antioxidants that protect the skin, and provides gentle exfoliation to improve your complexion and make your face glow. Yogurt contains probiotic bacteria that protect your skin and enhance its natural ability to fight acne bacteria. 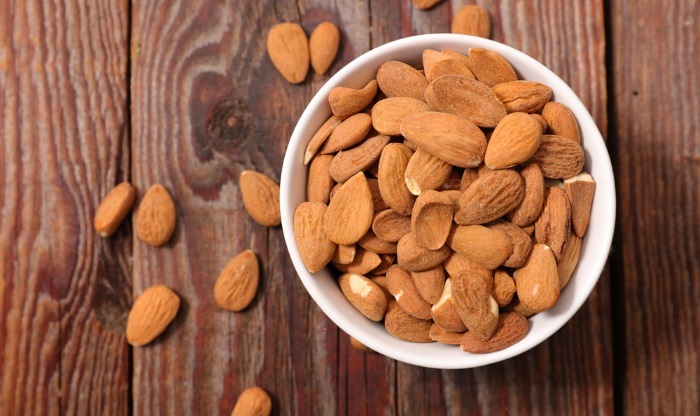 Almond oil is safe for most people to use, but it's recommended for people with nut allergies to not use it. As a precaution when using any new substance on your skin, it's best to test a small amount on the back of your wrist first. Leave the oil for about 20 minutes to see how your skin reacts before applying it to a larger surface such as your face. Almond oil has a 2 out of 5 rating on the comedogenicity scale. This means that the risk of it blocking skin pores is considered moderate. If you suffer from acne this is something to be aware of. It doesn't mean that you will have problems with it, but watch how your skin reacts and discontinue use if it makes your breakouts worse. 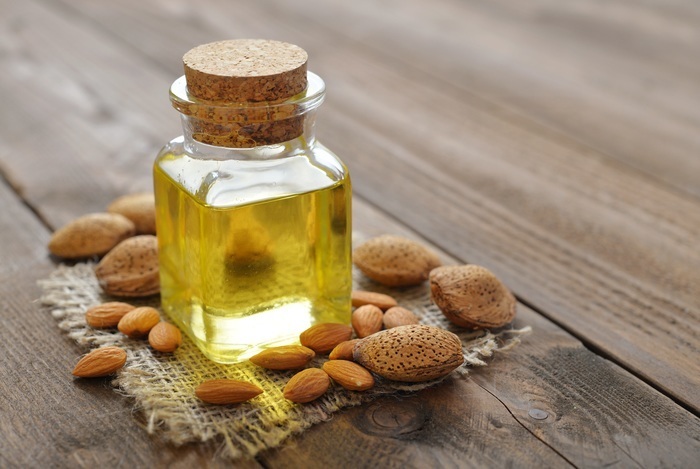 Can sweet almond oil lighten skin? 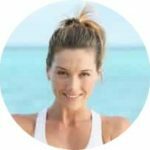 Although there are many natural health websites that say unequivically that it can, there’s no reliable evidence that it can lighten skin, reduce tan, remove dark circles under the eyes, or that it’s useful for skin whitening. Is sweet almond oil good for acne prone skin? It can help to dissolve and clean away excess sebum and dirt that can block skin pores, and anecdotal reports from people who have used it as part of their acne treatment are generally good (3). However, it does have a comedogenicity rating of 2. This is a moderate rating, so some people might find that it blocks their pores and makes their acne worse. Is sweet almond oil good for oily skin? Almond oil can help to cleanse excess oil from your skin. However, a minority of people find that it blocks their skin pores causing acne breakouts. Almond oil is an excellent moisturizer that’s easily absorbed by the skin, making it a good choice for people with dry skin. Does sweet almond oil darken skin? There is no reliable evidence that it darkens the skin. Is sweet almond oil good for baby skin? Yes, it has the same beneficial properties when used on baby skin and is sometimes recommended by dermatologists for this purpose. However, it’s best to check with your pediatrician first. What a beautiful website. Congratulations . I’m your follower. I look forward to your new writings.